Have you ever come off the trail after a long day hike or even a few days in the woods, only to find the battery in your car is dead, or worse one of your tires have gone flat? How about camping at a site that has no hookups and you don't have an extension cord or a power inverter in the car to power that air pump for the air mattress? While these haven't necessarily happened to us, but so long as we keep the PEAK® Portable Power System 450 Plus in the vehicle, we shouldn't ever have to worry about any of these problems except maybe the flat tire issue but only if the tire has been puncture in some fashion and you don't have a plug kit. Not long ago, we were contacted by PEAK® Performance, the people who make and sell antifreeze. They wanted to know if we would like to have one of these power systems for review. Of course seeing what it was, we jumped on the opportunity. This thing is a beast, and I love using it so far. Of course, for some of it's uses I'd rather not have to use it because that means I have a flat tire and/or possibly a dead battery. We received this unit a few days after corresponding with their representative. Our very first use was to measure the tire pressure and inflate all tires back to the OEM recommended air pressure. After airing the tires in the Santa Fe, the Tire Pressure Monitoring light was back off, signifying that the tires were back to an acceptable range. The unit doesn't come fully charged and the manual states that you should charge it at least 72 hours before you use it. Of course I didn't read that part until after the tires were aired. Oh well, I get a little carried away sometimes. The Power System didn't seem to mind though. It also states that you should re-charge it after each use. I've somehow managed to not do that either. 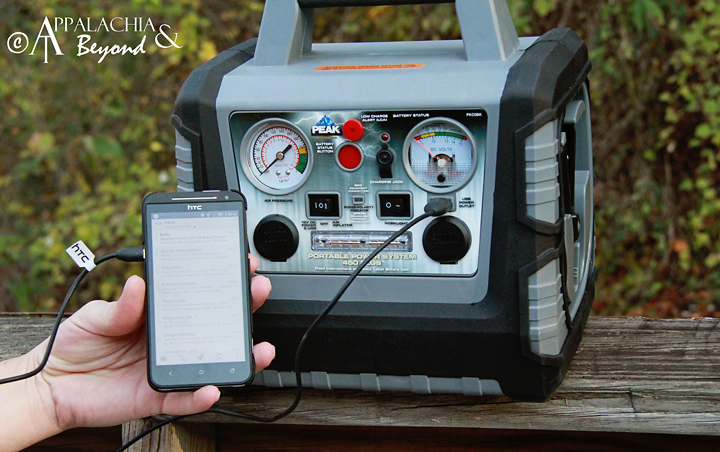 The next time we had a use for the PEAK® Portable Power System 450 Plus was over Labor Day weekend when we went camping. Let's just say that little thing packs a punch. It was nice to not have to string out an extension cord all the way from the vehicle to inside the tent to blow up our air mattress. Having the power system, I took it into the tent, plugged up the pump and bam! within minutes had our mattress sleep ready. Being that it was already dark, I left the work light on the station on so that Dinah would have a night light in the tent until we came to bed. That was done each night we were there, and then it was used again to deflate the air mattress once the camping trip was over. As of late, it has been staying in my car as my battery is going dead. Measuring a measly 170 cold cranking amps, if the car sits to long (over the weekend) without being started, then I usually have to use the power system to jump the car off. Let me tell how much easier that is compared to moving the Santa Fe to a point to were jumper cables can be an option. No, rather I just open my trunk, pull out the power system, hook up the jumper cables, turn on the battery jumper and my car starts like a charm. I've had to do this every Monday for the past 4 weeks. The most recent use of the power system, with only 25% of a charge left on it, was to use the USB port and the power inverter to charge mine and Robin's phones during a power outage we had this week. We didin't know when the power would be back on and both our phones needed charging if a) we were going to have an alarm for in the morning and b) my phone was going to be fully charged for the next day. It cranked right along for about 2 hours, when the power in the house finally came back on, at which point I turned off the power system and plugged it up to be recharged. Did I forget to mention how much I love this power system? It has to be hands down, one of the most versatile and useful tools a man or woman could ever have and for the price, quite a bargain if I do say so myself. With all that built in to one little system, there's not much it can't do. 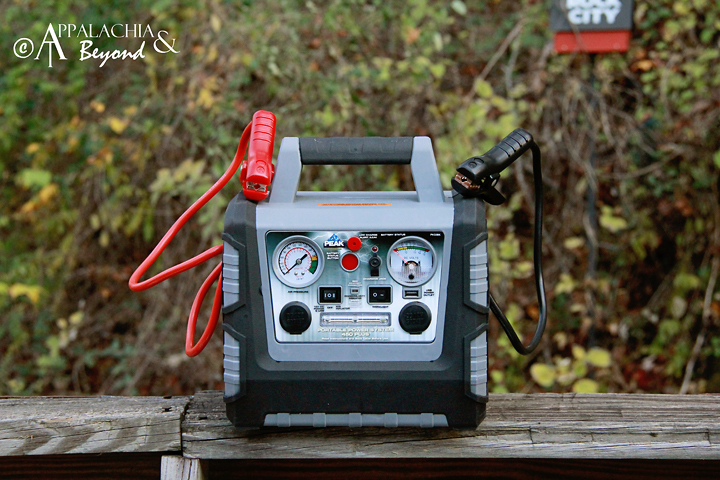 This is a prepper's little dream, and a must have for any outdoorsy type, because it is so much more than just a car battery jump-starter or tire inflator. I wonder how long it would run a Ham Radio on one full charge? Sounds like the next test for this little unit. 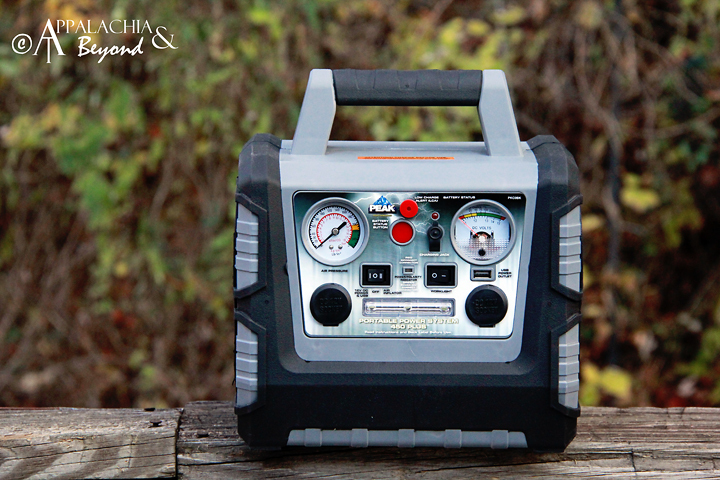 Anyway, we highly recommend the PEAK® Power System 450 Plus regardless of whether you are an outdoorzy type or not. 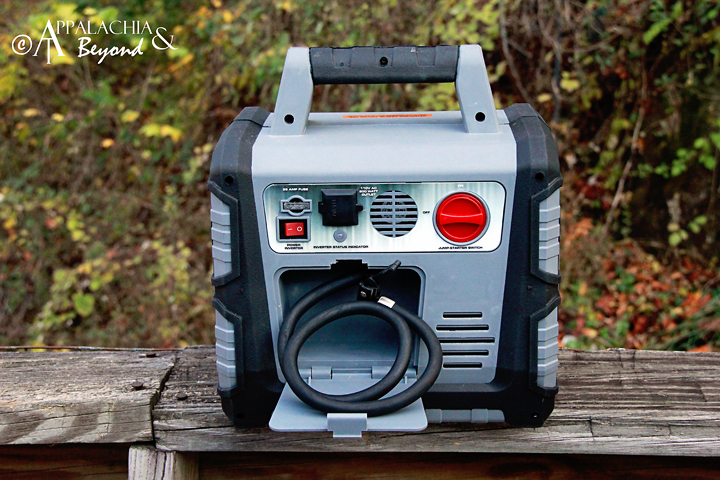 This thing serves a multitude of purposes and would make the perfect gift for your honey to keep in the car for emergencies, in the workshop in the man cave, or to have for when the power is out and you need to power an item or two. You definitely will not be disappointed with it. 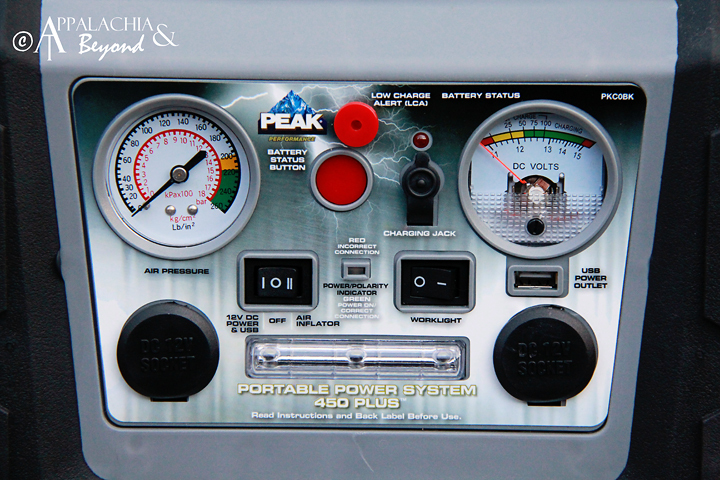 Disclaimer: Tim and Robin received the PEAK® Power System 450 Plus from PEAK® Performance for review purposes only. Appalachia & Beyond is in no way affiliated with PEAK® Performance and are not being compensated by PEAK® Performance for this review. The opinions expressed above are Tim's and Robin's independent thoughts and experiences.